Today's enterprise applications reside on both the network and in the cloud. These applications can be either productive business solutions or counterproductive-and often dangerous-diversions. Critical applications need bandwidth prioritization, while social media and gaming applications need to be bandwidth throttled or even completely blocked. Traditional stateful packet inspection firewalls only scan for ports andprotocols-not applications-so they cannot tell the good applications from the bad. SonicWALL E-Class Network Security Appliance (NSA) Series solutions provide enterprise-performance featuring tightly integrated intrusion prevention, anti-malware protection and application intelligence, control and visualization. Combining SonicWALL's patented Reassembly-Free Deep Packet Inspection® (RFDPI)* technology with a powerful multi-core hardware platform, E-Class NSA Series solutions can analyze and control thousands of unique applications, even if encrypted with SSL. Integrated application traffic analytics reporting provides the E-Class NSA Series with powerful insight into network usage. Comprised of SonicWALL E-Class NSA E8510, E8500, E6500 and E5500 appliances, the E-Class NSA Series offers a broad range of scalable solutions for the most demanding of enterprise deployments in data centers, campus networks and distributed environments. As inline solutions, the E-Class NSA Series leverages existing infrastructure while adding an extra layer of network security and visibility. In security gateway deployments, it adds secure remote access, high availability and other enterprise features. The E-Class NSA Series is a key part of SonicWALL's portfolio of enterpriseclass products and services for network security, email security and secure remote access. SonicWALL's Next-Generation Firewall including Reassembly-Free Deep Packet Inspection tightly integrates intrusion prevention, malware protection, and newly enhanced application intelligence and control with real-time visualization. Powerful intrusion prevention protects against a comprehensive array of network-based application layer threats by scanning packet payloads for worms, Trojans, software vulnerabilities, application exploits, and other malicious code. Application intelligence, control and visualization provides granular control, data leakage prevention, and real-time visualization of applications to guarantee bandwidth prioritization and ensure maximum network security and productivity. 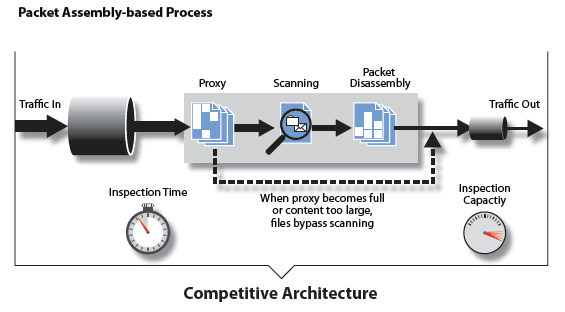 Reassembly-Free Deep Packet Inspection technology provides control for thousands of applications and detects millions of pieces of malware to protect the network automatically and seamlessly, while inspecting hundreds of thousands of connections simultaneously across all ports, with near zero latency and unlimited stream size. Flexible deployment as either a traditional gateway or as an inline solution allows administrators to keep their existing network infrastructure, while adding application intelligence and control as an extra layer of security and visibility. Deep Packet Inspection of SSL-encrypted traffic (DPI-SSL) transparently decrypts and scans both inbound and outbound HTTPS traffic using SonicWALL RFDPI. The traffic is then re-encrypted and sent to its original destination if no threats or vulnerabilities are discovered. The SonicWALL Global Response Intelligent Defense (GRID) Network continually updates threat protection, intrusion detection and prevention and application control services on a 24x7 basis to maximize security. The full suite of threat prevention services can defend against over a million unique malware attacks. WAN acceleration decreases latency and increases transfer speeds between remote sites for even higher network efficiency gains. Remote access for the mobile enterprise provides secure connectivity to corporate resources from Windows®, Linux®, Apple® Macintosh and iOS and Google® Android™ devices. Active/Active Clustering of up to four pairs of SonicWALL firewalls lets you assign traffic flows to each node, providing load sharing, redundancy and greater throughput without a single point of failure. Border Gateway Protocol (BGP) support enables alternate network access paths (ISPs) if one path fails. 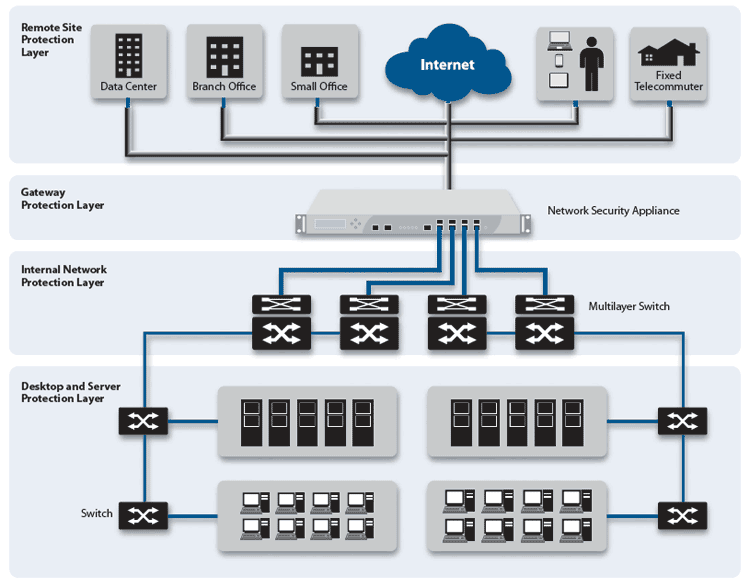 Combined with Active/Active Clustering, BGP improves business continuity and productivity. More concurrent SSL VPN sessions add scalability, while extending End Point Control to Microsoft® Windows® devices ensures anti-malware and firewalls are up-to-date. SonicWALL Application Intelligence and Control provides granular control, DLP and real-time visualization of applications to guarantee bandwidth prioritization and ensure maximum network security and productivity. An integrated feature of SonicWALL Next-Generation Firewalls, it uses Reassembly-Free Deep Packet Inspection technology to identify and control applications in use, regardless of port or protocol. With a continuously expanding threat signature database that currently recognizes over 3,700 applications and millions of malware threats, it can maintain granular control over applications, prioritize or throttle bandwidth and deny web site access. 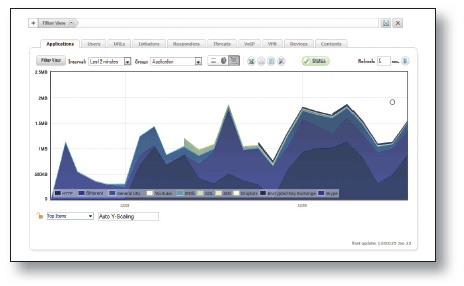 The SonicWALL App Flow Monitor provides real-time graphs of applications, ingress and egress bandwidth, active web site connections and user activity, and can continuously send data to NetFlow/IPFIX analyzers. 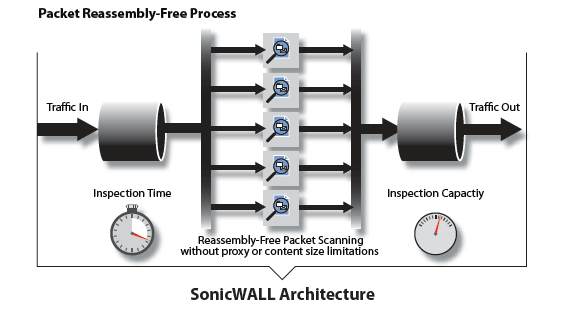 SonicWALL Reassembly-Free Deep Packet Inspection delivers a scalable application inspection engine that can analyze files and content of any size in real-time without reassembling packets or application content. This means of inspection is designed specifically for real-time applications and latency sensitive traffic, delivering control without having to proxy connections. Using this engine design, high-speed network traffic is inspected more efficiently and reliably for an improved end user experience. Central-site Gateway: Deployed as a central-site gateway, the E-Class NSA Series provides a high-speed scalable platform, providing network segmentation and security using VLANs and security zones. Redundancy features include WAN Load balancing, ISP failover and Active/ Active DPI. Layer 2 Bridge: Layer 2 bridge mode provides inline intrusion detection and prevention, adds an additional level of zone-based security to network segments or business units and simplifies layered security. Additionally, this enables administrators to limit access to sensitive data by specific business unit or database server. Wire mode: In addition to, Layer 2 Bridge Mode and other traditional interface modes, E-Class NSA also features Wire Mode, which provides four methods nondisruptive, incremental insertion into networks: Bypass Mode, Inspect Mode, Secure Mode and Tap Mode. The E-Class NSA Series incorporates ultra-high performance Virtual Private Networks (VPNs) that easily scale to thousands of endpoints and branch offices. Innovative SonicWALL Clean VPN™ technology prevents vulnerabilities and malicious code by decontaminating traffic before it enters the corporate network, in real-time and without user intervention. 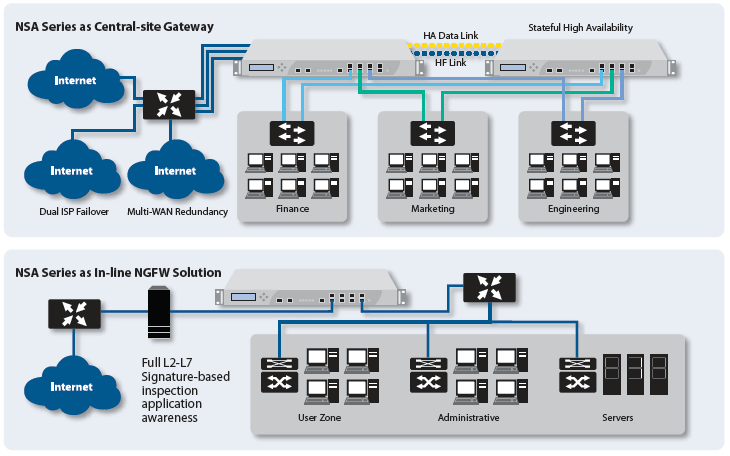 Easily integrated into existing environments, E-Class NSAs centralize gateway-level protection across all incoming and outgoing applications, files and content-based traffic, while controlling bandwidth and applications, without significantly impacting performance or scalability. The highly-configurable E-Class NSA Series extends protection over the internal network by inspecting traffic over LAN interfaces and VLANs. Specifically designed for LAN network threats, the E-Class NSA Series monitors and responds to internally spreading malware, denial of service attacks, exploited software vulnerabilities, confidential documents, policy violations and network misuse. In addition to network and gateway based protection, the E-Class NSA Series provides additional endpoint protection for workstations and servers through an enforced anti-virus and anti-spyware client with advanced heuristics. This enforced client solution delivers network access control by restricting Internet access on endpoints that do not have the latest signature or engine updates. When enforcement is enabled on the appliance, each endpoint is directed to download the enforced anti-virus and anti-spyware client without any administrator intervention, automating the deployment of endpoint security. The SonicWALL Global Management System (GMS®) provides organizations, distributed enterprises and service providers with a flexible, powerful and intuitive solution to centrally manage and report on E-Class NSA Next- Generation Firewalls. Each E-Class Network Security Appliance supports an expanding array of dynamic subscription-based services and software designed to integrate seamlessly into any network. Gateway Anti-Virus, Anti-Spyware and Intrusion Prevention Service delivers intelligent, real-time network security protection against sophisticated application layer and content-based attacks including viruses, spyware, worms, Trojans and software vulnerabilities such as buffer overflows. Application Intelligence and Control provides real-time visualization of network traffic, customizable policies and highly granular control over applications and users. Content Filtering Service enforces protection and productivity policies by employing an innovative rating architecture, utilizing a dynamic database to block over 56 categories of objectionable web content. Analyzer is an easy-to-use web-based application traffic analytics and reporting tool that provides real-time and historical insight into the health, performance and security of the network. E-Class Support 24x7 is designed specifically for E-Class customers, E-Class Support 24x7 delivers enterprise-class support features and quality of service. E-Class Support 24x7 includes direct access to a team of highly-trained senior support engineers for telephone and web-based technical support on a 24x7x365 basis, software and firmware updates and upgrades, Advance Exchange hardware replacement, access to electronic support tools, moderated discussion groups, and more. Deep Packet Inspection for of SSL-Encrypted Traffic (DPI-SSL) transparently decrypts and scans both inbound and outbound HTTPS traffic using SonicWALL RFDPI. The traffic is then re-encrypted and sent to its original destination if no threats or vulnerabilities are discovered. Enforced Client Anti-Virus and Anti- Spyware (McAfee) working in conjunction with SonicWALL firewalls, guarantees that all endpoints have the latest versions of anti-virus and anti-spyware software installed and active. SonicWALL Mobile Connect™, a single unified client app for Apple® iOS and Google® Android™, provides smartphone and tablet users superior network-level access to corporate and academic resources over encrypted SSL VPN connections. DPI-SSL Provides the ability to decrypt HTTPS traffic transparently, scan this traffic for threats using SonicWALL's Deep Packet Inspection technology (GAV/AS/IPS/Application Intelligence/CFS), then re-encrypt the traffic and send it to its destination if no threats or vulnerabilities are found. This feature works for both clients and servers. 3 Actual maximum connection counts are lower when Full DPI services are enabled. 5 The Comprehensive Anti-Spam Service supports an unrestricted number of users but is recommended for 250 users or less. *USB 3G card and modem are not included. 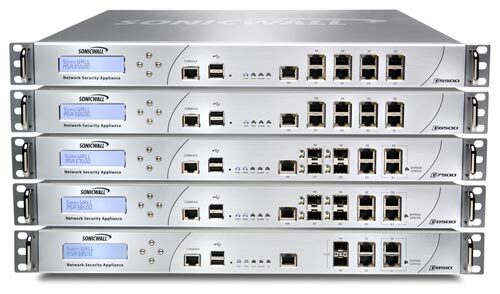 See http://www.sonicwall.com/us/products/cardsupport.html for supported USB devices.